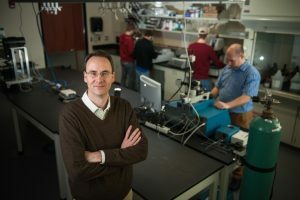 The University of Alabama’s Board of Trustees named Dr. Gregory B. Thompson, professor in the department of metallurgical and materials engineering, a University Research Professor earlier this month. Dr. Gregory Thompson’s research emphasis is in the thermodynamics and mechanisms of phase transformations and their effect on microstructure. Trustees can appoint the title in recognition of extraordinary, internationally recognized scholarly attainment in an individual field. Thompson serves as director of UA’s Central Analytical Facility and director of the materials science doctoral program. He joined the University as an assistant professor in 2003, received tenure and a promotion to associate professor in 2008, and became a full professor in 2012. During his time at UA, Thompson gained global recognition as a leader in the study of the mechanisms that underlie structural phase transitions in materials. His research interests include phase transformations, deformation mechanisms and analytical microscopy. He has studied a variety of materials including magnetic thin films, shape memory metal alloys, ultrahigh temperature ceramics and most recently ceramic fiber processing. He has also participated in extended research visits at Sandia National Laboratories in New Mexico, the Air Force Research Laboratory in Ohio and Dynetics in Alabama. In 2012, Thompson served as organizing chair for the 53rd International Field Emission Symposium that brought more than 170 scientists from 15 countries to the campus for a weeklong conference on atom probe and high field nanosciences. Thompson has received more than $12 million in funding from sources such as the National Science Foundation, NASA, various U.S. Department of Defense agencies, national laboratories and industrial partners. He has authored or co-authored more than 170 journal articles, conference proceedings and extended abstracts along with three book chapters. He has mentored nearly 20 master’s thesis students and 20 doctoral students to graduation since joining UA. He has served as the chair for the Phase Transformation Committee of The Minerals, Metals and Materials Society, secretary for the International Field Emission Society, and is an active member of the Microscopy Society of America. Thompson was given both the TMS Young Leader and the National Science Foundation CAREER awards in 2005. In 2007, he received an honorable mention for the TMS Young Faculty Fellow award, and a year later, he was named the TMS Japanese Institute of Metals Young Leader International Scholar. Thompson was recognized as a Brimcombe Medalist for his research in multiscale materials characterization from TMS in 2017. On campus, Thompson has been honored with the Hackney Leadership Award by the College of Engineering in 2018 and the UA Blackmon-Moody Outstanding Professor Award in 2014. He earned his bachelor’s degree in physics from Brigham Young University in 1996 and went on to earn both his master’s and doctorate in materials science and engineering from Ohio State University in 1998 and 2003, respectively.